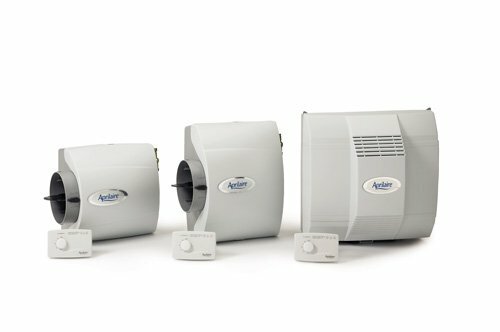 Humidifiers are a big part of HVAC systems in dry locations, especially in the winter. I have no experience with them personally because they aren’t prevalent at all in Florida. I asked some of the HVAC School contributors to weigh in with some of their top humidifier tips – Thanks to Nathan Perney, Steve Domansky and Allen Pavolko for weighing in. We do a LOT of humidifiers here in dry old Denver. My take on selection, like most things I do, is a little different than most. If we look at section 27 in the eighth edition of Manual J there is a great methodology for determining winter humidification load. First and for most get a good estimation of wintertime infiltration and exfiltration. That’s right! set up the blower door. This step rarely happens. Next, determine your target indoor humidity. That part is a little tricky. Manual J shows some calculations for determining winter humidity that will keep the building safe. Safe means dry. Dry means no hidden condensation. Page 139 in the Builder Guide to Cold Climate Construction shows the same calculation. I like Lstiburek’s approach over Rutkowski with regard to the humidity target. It’s the same math, I’ve just been a disciple of Lstiburek for longer. Haha. Once you get the target humitity, convert you CFM of air leakage to a mass air flow of air leakage. Lets say we have a house leaking 100cfm at my air density of .0613 lb per cu/ft that would be 6.13 lbs of air per minute. Now convert you mass air leakage to grains of air leakage. 6.13lb/min of air leakage at 50%rh at 70*f=66.6grains per minute x 60 minutesx 24 hours=95,904 grains per day. WOW! We know there are 7,000 grains per pound. That give us 13.7 pounds of water a day, or about 1.7 gallons per day, or .07gallons per hour. Alright! Now we can take the gallons per hour and look at the humidifier specifications. Based on the Aprilaire data we might want the 400, 600, or 700 series. The manufacturer alludes to this calculation in the performance information. The really interesting thing is the air leakage component. Older leaky houses need WAY more humidity that new tight houses. Just like the how the warmth from our heating systems leak out before can feel it. In old leaky buildings, the humidity leaks out before you can sense it. How ever in newer tighter houses we can have problems. In fact, I have seen several new tight houses over humidifying and having serious condensation issues. Water is amazing, it moves mountains. And it destroys buildings better than pretty much any thing aside from explosives. The good thing is cold air is dry air, so drying building in the winter is much more realistic than during the summer. Wait, what did I just say drying a building during the winter. You better believe it. Depending on what you do in your home, how tight your home is, and what the building assemblies are comprised of, you may well need to dry the building during the winter. Just ask the Canadians. As building codes are pushing building tightness tighter and tighter( this is a good thing) we will see more over humidification issues. Over humidification of new buildings in cold climates is a very serious issue we will begin seeing more and more. The biggest install failure is not getting the drainage correct. Test the drains, or your asking for problems. Test the operation, or your asking for problems. Make sure they turn on and off when you ask them to. I had a job recently where a stem humidifier was wired to create steam any time the unit had power. The installer wired the relay incorrectly and we had 75*f 70% humidity in the house. The windows were raining. It was awesome. Like anything read the dang manual. Steam humidifiers are very temperamental, if you dont follow the manual you will have problems. Steam humidifiers have very specific tolerances for where and how they can and can not be installed. One thing to be vary of is you are setting up a steam humidifier to operate with constant fan. Check the velocity of the air during fan only mode. If the air is not moving fast enough you will get condensation in the duct work (this is bad). Another common install error is the HUM terminal on the control board may 1200r 24 VAC. All residential humidifiers that I know of require 24VAC to control the unit. If You don’t install a isolation relay you will fry the solenoid valve. Choosing the right humidifier for your home depends on multiple things. These include, but are not limited to: size of the home, heating system, ductwork availability, and geographic location. Where I live (Southwestern NY, near Buffalo), most homes that have a forced air furnace have a bypass humidifier installed to help keep the relative humidity in the living space during those dry winter days. Due to cold air not being able to hold as much moisture, we tend to lose humidity in the winter time. This can lead to higher counts of airborne viruses staying alive in the air, static electricity build up, drier skin, improperly sealed/treated wood cracking, etc. Keeping the humidity between 30% and 50% in the living space year round can help battle all of those things. The biggest thing to choosing a humidifier, in my opinion, is what ductwork you have available to attach a system to. If you have enough room to install a bypass humidifier, you can treat up to a 4,000 sq ft house with one, but you need ample room to mount the humidifier and pipe it to the other airstream. If you don’t have the room to do that, or have a bigger house, you can do a power humidifier. These have a fan built into them to push the air through the media and can treat up to 4,200 sq ft. The last option for ducted systems is a steam humidifier, which can be remote installed and piped into the airstream. These systems can treat up to 6,200 sq ft of living space and take significantly less space to install, and can be remote as I stated prior. If there is no ducted system in the space, then you can get a non-ducted system which just adds water vapor to air and lets natural convection currents take over to distribute. Or you can use a steam humidifier paired with a fan pack to distribute the water vapor to a central location. Best Scenario is to install the humidifier unit on the supply air plenum with it piped over to the return air drop. Our local rep for a well-known humidifier manufacturer advised to use hot water for the feed tube as often as possible, as it helps the water evaporate faster. Always utilize a flow restrictor on the water supply, as to not add way too much water to the evaporation pad. These things together make for the best, in my opinion, way to get humidified air into the living space. The hottest air passes over already warm water on the pad and evaporates as quickly as allowed. This goes into the airstream and passes back through to the house. If possible, install an outdoor air temperature sensor to automatically control humidity levels in the home. The most common mistake I have seen in the field is failing to make sure the humidifier is level and plumb. This can cause the unit to leak! Another common mistake is removing the fabric out of the distribution tray because it looks and feels gritty. This is there for a reason, and that is to allow the water to flow through each distribution channel evenly. I have often seen a solenoid valve misdiagnosed as being bad, due to water not flowing through it. I live in an area with high mineral content in the water, this, coupled with the small diameter water piping and small orifice, often leads to a plugged up orifice/flow restrictor.